Original natural complex for an active life free from anxiety and stress! For the first time, ANXIOMEDIN® has combined the standardized extracts of ashwagandha, passionflower and L-theanine to effectively combat anxiety, stress and their outcomes. ANXIOMEDIN® relieves the manifestations of anxiety due to: lowering the level of cortisol in stress, regulating and generating alpha brain waves, stimulating the receptors and synthesis of GABA. Ashwagandha extract has a proven adaptogenic effect, i.e. it improves the ability to cope with stress. In overstraining, it helps the body to normalize physiological processes and adapt to changes. Clinical studies have demonstrated that Ashwagandha has a potent anxiolytic effect that has been confirmed not only by changes in the anxiety scale scores but also by its direct ability to lower the level of cortisol, a stress hormone. L-theanine is a natural amino acid derived from glutamic acid. L-theanine has a relaxing effect, calms the nerves, improves the concentration ability and attention without any direct sedative effect. L-theanine improves the synthesis of GABA in the brain and, on its own, is able to stimulate the GABA receptors; it generates and regulates the alpha waves (with a frequency of 8-12 Hz) in the brain associated with relaxation, concentration and creative activity in humans. Clinical studies have demonstrated that L-theanine potentiates the alpha activity of the brain and reduces the level of anxiety based on the anxiety scale scores. Passionflower extract contains indole alkaloids (harmane, harmine, harmol), certain flavonoids (vitexin, quercetin), as well as coumarins, quinones etc. The ingredients of the extract inhibit monoamine oxidase (MAO) and activate the GABA receptors in the brain. Clinical studies have demonstrated that the passionflower extract relieves anxiety, nervous strain and has a moderate anxiolytic effect. ANXIOMEDIN® is the best nature has created for anxiety disorders! NUTRITIONAL AND ENERGY VALUE (CALORIC VALUE) FOR DAILY INTAKE (3 CAPSULES OR 900 mg): proteins – 0.135 g, carbohydrates – 0.0099 g, fats – 0 g; 0.5796 kcal/2.4246 kJ. 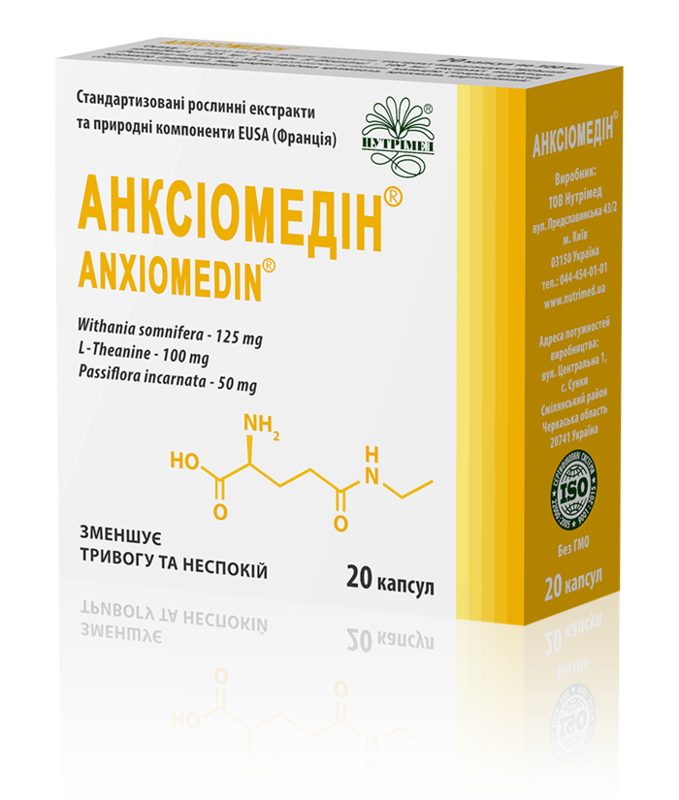 RECOMMENDATIONS FOR USE: ANXIOMEDIN® is recommended as an additional source of biologically active substances of herbal origin and amino acids to reduce the manifestations of anxiety, uneasiness, inner tension, irritability. It has neuroprotective, adaptogenic and mild anxiolytic properties in emotional and oxidative stress, helps relieve the negative effects of daily stress in the body, improves overall health, increases work productivity, relieves fatigue; it does not impair concentration power or cause drug tolerance. METHOD OF ADMINISTRATION AND RECOMMENDED DAILY DOSE: adults should take 1-3 capsules daily after meals swallowed with plenty of drinking water. The duration of administration is 1 to 3 weeks. Medical advice is recommended before use. CONTRAINDICATIONS: pregnancy, breastfeeding, individual hypersensitivity to the ingredients, pediatric use, severe cardiovascular diseases, alcohol abuse. Should not be used as a substitute for a balanced diet. PHARMACEUTICAL FORM: capsules with the contents weight of 300 mg ± 7.5%. STORAGE CONDITIONS: store in the original package at temperatures below 25°C in a dry place protected from light and out of reach of children. MANUFACTURING DATE: see the manufacturing date on the package. SHELF LIFE: 24 months from the manufacturing date. MANUFACTURING BATCH NUMBER: specified on the package.